This is the story of how Goldmoney botched the communication of a fundamental change in policy, that ultimately may lead to me taking my business elsewhere. As you know from reading my book, I’m a fan of the Harry Browne “Permanent Portfolio”, which promotes holding a quarter of your wealth in gold, and at least a part of which is held in physical gold. Back in the day, there were two major online options for purchasing and storing physical gold—BullionVault and the original GoldMoney. Both were located in the United Kingdom, and each controlled over a billion dollars in gold for their respective customers. While both services offered web-based access to their customers, they both felt old-fashioned and rigid. Neither company’s websites would win any kind of design award, although BullionVault’s was, in my opinion, thoughtfully useful. Both companies restricted incoming and outgoing funds to a single linked bank account. Account changes required phoning in. While GoldMoney allowed you to buy and sell directly with them, BullionVault implemented an “exchange” model, whereby you felt like a participant in a “marketplace”. Both companies had similar revenue models—BullionVault charged commission on both buying and selling, while GoldMoney charged only on buys (though that commission was considerably higher). And both companies charged an annual fee to store your gold. Later, a third player emerged, located in Canada, which caught my attention—BitGold. BitGold’s stated mission was to build technology that allowed one’s gold savings to be used as a currency. Compared to BullionVault and GoldMoney, BitGold felt innovative and modern. You could buy gold with your credit card, or even Bitcoin. You could link multiple bank accounts. You could transfer gold instantly between members. You could even spend gold in the form of a gold-backed MasterCard. Having hired the talented and motivated designer, Mike Busby, the BitGold website looked and behaved like the kind of high-quality website my own company strives to build for its customers. Now, as you know from my book, long-term investors are particularly sensitive to annual fees, due to their destructive compounding effects over time, and so the absence of storage fees was a highly attractive selling point for BitGold. In terms of revenue models, given that BitGold themselves would certainly have storage fees, it was speculated that their business model hinged on earning surplus revenue through their technology-driven value-add services. I didn’t initially open an account with BitGold, since they were still a new and unproven participant in the market, but that changed when the news emerged that BitGold had acquired GoldMoney, providing them with an considerable jump-start, and making them one of the world’s largest retail holders customer gold. We created GoldMoney with the vision of making gold accessible for savings and payments, a vision that BitGold is rapidly expanding in a new era of cloud computing and mobile technology. […] Users can expect a gold debit card, expanded payment options, as well as the many applications and features being developed by this innovative team. One step towards this integration seemed to occur several months later when the company announced that BitGold was changing its name to “Goldmoney” (dropping the capital, “M”), and introducing three types of accounts. My own account became a “Personal” Goldmoney account. A “Business” account was introduced for businesses. Finally, a “Wealth” account was introduced, that included storage fees, but benefitting from things like a special phone number to call for support, a dedicated “relationship manager”, the ability to hold money in several different currencies, and a couple of other features that I had no particular interest in. It seemed the terms of my own, now “Personal”, account fortunately remained unaffected. Which was true for a while, anyway—bringing us to today, and to the point of this story. While Personal accounts are still free of storage-costs, they are now limited to holding 1,000 grams of gold. Once you reach that limit, you are not allowed to purchase more, and are directed to open a separate Wealth account, which does apply storage fees of between 0.18% to 0.12% per year, and increases purchase commissions from 0.5% to 2.5%. Existing Personal accounts with more than 1,000 grams of gold will not be forced to reduce their balance, but will have 0.18% storage charge applied to that portion of balance above 1,000 grams, and no further purchases can be made in the accounts. Wealth accounts are held with a completely different company, i.e. the corporate entity behind the original GoldMoney service, located in the UK Channel Islands, and not the company behind the Personal accounts, located in Canada. When you login to a Wealth account, you’re transported back in time to the original GoldMoney website, with only a visual update (currently in beta) to provide some consistency with the Goldmoney (nee BitGold) product. Gold purchases are subject to a 2.5% commission, with no commission for sells. For comparison, BullionVault (and Goldmoney Personal accounts) charge 0.5% on buys and sells, and so your Goldmoney Wealth account purchases would need to appreciate by a factor of four before you’d come out better there. Storage fees between the two are nearly identical. Unless your Personal holdings are stored in the Toronto vault, it’s going to cost you a 0.5% vault-to-vault transfer charge to move funds from Personal to Wealth. This seems to change the basic Goldmoney service proposition to something sort of analogous to “checking” and “savings” accounts with a bank—i.e. you’re to hold your savings in a Wealth account, and any funds you want to use for low-fee transacting should be held in a balance-limited Personal account. But while all this represents a fundamental, and arguably unfortunate, change, it’s not what I’m here to complain about. What I’m here to complain about is the way in which Goldmoney has communicated this change, which relates to the issue of trust. It would not be surprising to learn that BitGold/Goldmoney couldn’t manage to earn enough through their technology offerings to cover their own gold storage costs. Clearly, a company has to be profitable to be sustainable in the long-term and so even though it was good while it lasted, I can understand the need to apply storage costs. What I dearly wish, though, is that Goldmoney had simply communicated the changes in a straightforward plain-English way, respectful of their customers ability to understand the reality of the situation. 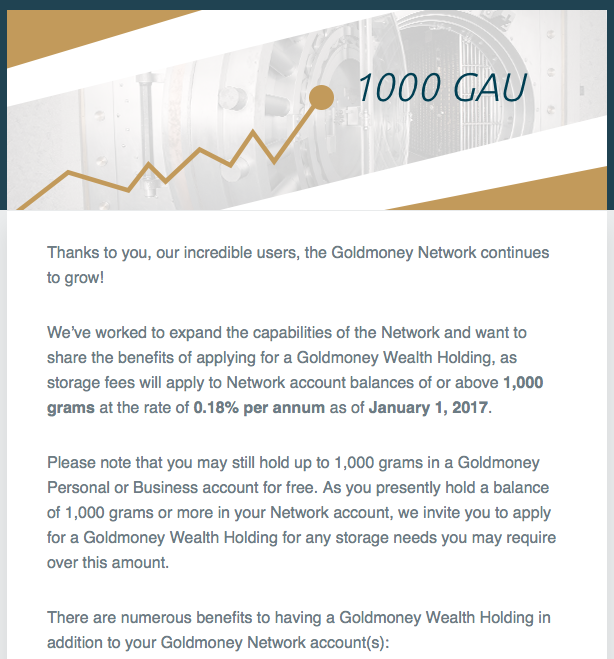 We’ve worked to expand the capabilities of the Network and want to share the benefits of applying for a Goldmoney Wealth Holding, as storage fees will apply to Network account balances above 1,000 grams at a rate of 0.18% per year as of January 1. You can NOT continue with your Personal account—If you’re currently a Personal account holder with over 1,000 grams, you must open a Wealth account in order to continue saving. There is no option to continue with your Personal account. The whole Goldmoney experience changes—If you decide to continue saving with a Wealth account, the whole experience will change. The company changes. The website changes. The funding methods will change (no more purchasing with credit cards). The costs will change. The transition may cost you—Depending where your Personal funds are vaulted, it may end up costing you 0.5% to move any excess balance from your Personal account to a new Wealth account, in order to get the storage fees down from 0.18% to 0.12%. Why this all had to happen—Most importantly, the email doesn’t explain why we’re being subjected to this change. 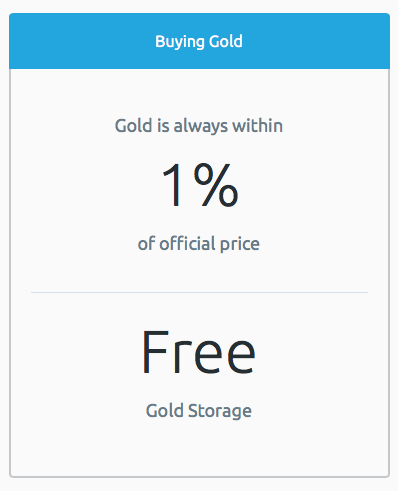 Reading it, you’d simply get the impression that, despite things going really, really well at Goldmoney, they’ve just decided to start charging Personal account holders with storage fees, above the arbitrary balance of 1,000 grams. To understand any of the above (except for the justification), you have to login to your Personal account, and try to make sense of all the error messages and alerts. Overall, this was a botched communication. If something goes wrong, tell people. […] Be as open, honest, and transparent as possible. Don’t keep secrets or hide behind spin. An informed customer is your best customer. Plus, you’ll realize that most of your screwups aren’t even that bad in the minds of your customers. Customers are usually happy to give you a little bit of breathing room as long as they know you’re being honest with them. Although the change at Goldmoney isn’t necessarily the result of a screwup, it’s a major event that completely changes the product experience for savers, involves an inconvenient transition, and potentially involves costs. First, it leaves me to figure out all the consequences of the changes myself. It was only when I logged into the website that I realized I could no longer use the Personal account. It was only when I started to create a Wealth account that I realized it’s a completely different company, with a different website that lacks many of the features of the Personal account. And it was only when I started the migration process that I realized costs will be involved. Second, it introduces distrust, and damages my confidence in this company. Is this how I can expect to be treated again in the future if/when they’re required to make major changes that affects me? The whole situation has left me with such a bad taste in my mouth that I’m quite likely to take my business elsewhere. I hope this story finds its way to those in charge at Goldmoney, and that the folks working in PR there learn the lesson that it’s OK to tell things as they are. Update 1 of 2: A week after posting this article, I posted some follow-up thoughts including a Twitter conversation I had with Goldmoney’s founders. Update 2 of 2: To clarify what I would have liked to have received, I’ve drafted an alternative version of the Goldmoney email. long-term savings, but rather for transactions, i.e. investors, our intent is for you to use our Wealth accounts. allow you to purchase more gold in your Personal account. will result in a 0.5% vault-to-vault transfer fee. $10,000. They do not have sell fees. As a Goldmoney customer with a Personal account balance above 1,000 grams, we need to communicate some changes that affect you. As background, we now offer three types of accounts—Personal, Business and Wealth. In broad strokes, our intent is that Personal accounts are not used for long-term savings, but rather for transactions, i.e. spending gold as currency. For savers and long-term gold investors, our intent is for you to use our Wealth accounts. To get from where we are today to that vision described above, some changes have to take place, and so here’s what you need to know and how you’ll be affected: - Previously, there was no limit on the amount of gold you could hold in a Personal account. We now limit Personal accounts to 1,000 grams.Since your account has more than 1,000 grams, we’re going to start charging a 0.18% annual storage fee on that portion of your balance above 1,000 grams. - Although you can leave your balance as is, we will not allow you to purchase more gold in your Personal account. To purchase additional gold, you will need to create a Wealth account. - A Wealth account is held with an affiliated, but different company, so you’ll need to go through KYC/AML procedures again. - You can link your accounts for the purpose of moving gold from Personal to Wealth. But only Toronto(Personal)-to-Toronto(Wealth) vault transfers are permitted, so if your Personal gold is held in another vault, you’ll first have to transfer it to Toronto, which will result in a 0.5% vault-to-vault transfer fee. - Wealth accounts have storage fees of between 0.12% and 0.18%, and purchase fees of 2.5% for purchases below $10,000. They do not have sell fees. - You can avoid those 2.5% buy fees, however, with a little trick—i.e. you can transfer enough gold from Personal to Wealth to free up some balance in Personal. Then, you can do your purchasing in Personal, and transfer the proceeds to Wealth at no cost. We know this is a bit inconvenient, and possibility confusing. We needed to make this change, however, to align our account types with our different lines of business strategy. If you have any questions about these changes, don’t hesitate to contact us.